This delicious Taco Casserole is like a taco salad in casserole form! With a ground beef and biscuit base, layers of sour cream, lettuce, tomatoes, cheese, and olives, this taco bake is perfect for dinner or your next potluck. Taco Salad is a classic dinner recipe. 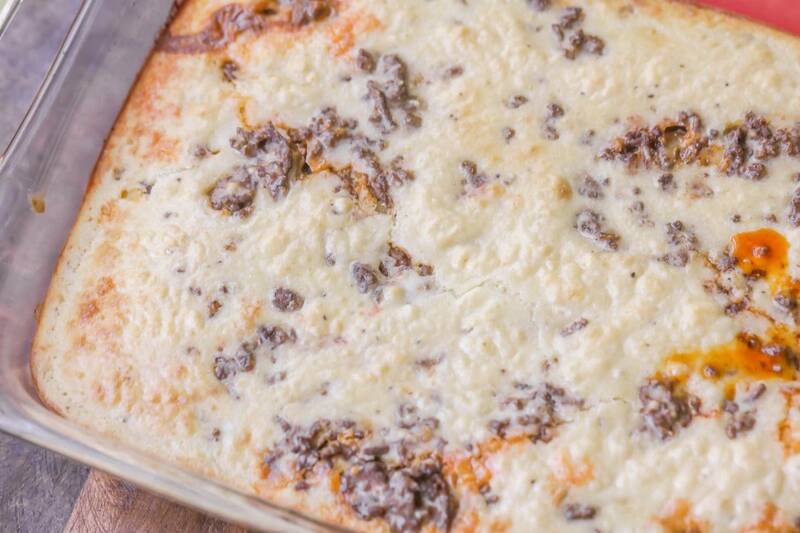 Today’s recipe is a twist on that meal but in casserole form – Taco casserole. 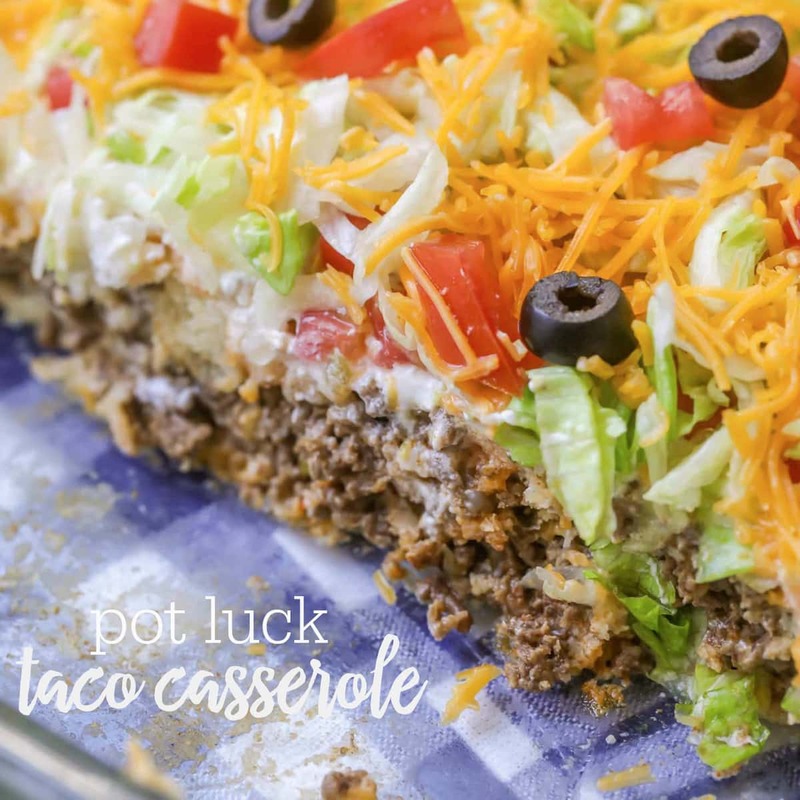 Yes, this Potluck Taco Casserole is so delicious and has all the great flavor of taco salad making it a family favorite. We made it years ago and had almost forgotten about it until we recently re-made it. 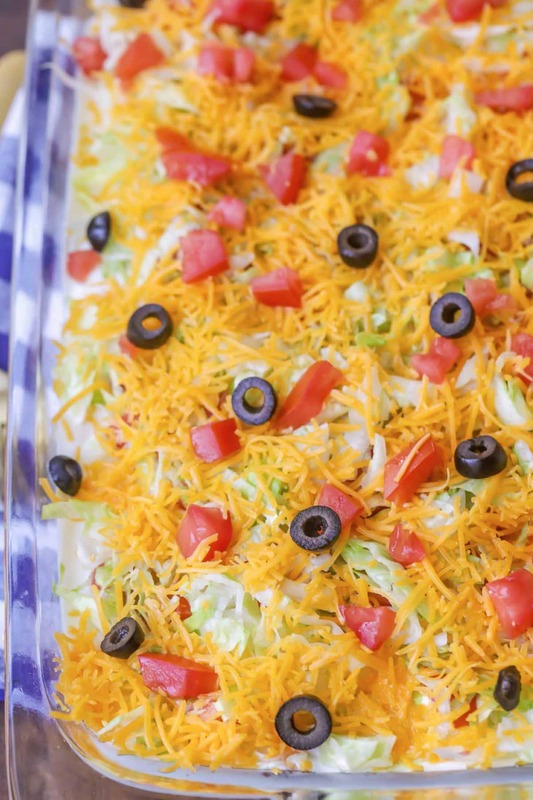 We forgot how great it was and wanted to make sure you got to try this easy taco bake recipe. The biscuit and ground beef base taste just like chips and beef in regular taco salad and the toppings make it taste just like it too. 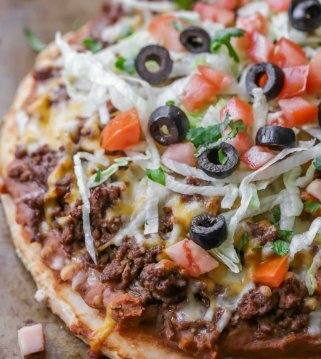 You can add all the ingredients you love but we usually add sour cream, lettuce, tomatoes, cheese and olives! 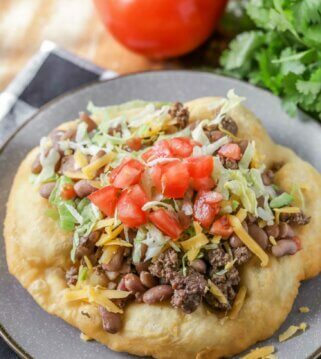 Like I mentioned before, this recipe is kind of like a Taco Salad or Navajo Taco, but in casserole form! It has all the same ingredients as a taco (with a biscuit layer instead of chips, tortillas, or fry bread). You could even add extra toppings like: refried beans, black beans, salsa or guacamole. To make the taco bake, just cook the ground beef over medium heat, drain, and add the taco seasoning. Spread the meat on the bottom of a 9×13 pan. Beat the eggs, milk, biscuit mix, and pepper until well combined and pour over ground beef. Bake at 400° for 20-25 minutes until golden brown. Let it cool for a few minutes, and then spread on sour cream. Top with your desired toppings (we do lettuce, tomato, cheese, and olives), and ENJOY! Can I make taco casserole ahead of time? Yes, you can make this ahead of time. After baking the biscuit/meat mix let cool and cover. Prepare toppings and store in separate containers. Store all ingredients in the fridge for up the 24 hours. When you’re ready to serve it heat the biscuit/meat mix in the oven at 350 degrees F for 10-15 minutes or until warm. Layer remaining ingredients per recipe instructions. How long can leftovers last in the fridge? Leftovers can last in the fridge for about 3 days. Reheating gets a little tricky as you don’t want to put lettuce in the microwave or oven. I’d suggest removing the topping as best you can. Place the desired serving in the microwave for 30 second increments until hot. You can also heat in the oven at 350 degrees for 5-10 minutes depending on the amount. Once hot place lettuce topping mix back on and enjoy! Can I freeze taco casserole? You can freeze the base of the taco casserole for up to 3 months. Once the biscuit/meat has been baked, allow to cool, wrap in plastic wrap then again with aluminum foil, place in the freezer. When you’re ready to use thaw and bake uncovered in the oven at 350 degrees F for 10-15 minutes or until warm. Layer remaining ingredients per recipe instructions. 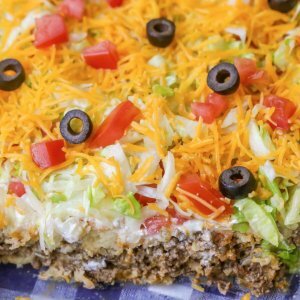 What to serve with taco bake? This delicious Taco Casserole is like a taco salad in casserole form! With a ground beef and biscuit base, plus layers of sour cream, lettuce, tomatoes, cheese, and olives, this casserole is the perfect way to switch up your dinner routine. Cook beef over medium heat in a large skillet until no longer pink. Drain meat and add taco seasoning and prepare according to package directions. Add meat to a greased 9x13 pan and set aside. Beat eggs and milk in a large bowl. Stir in biscuit mix and pepper and mix until combined well. Pour over meat and bake until golden brown (about 20-25 minutes). Let cool for a few minutes and then spread on sour cream. Top with lettuce, tomato, cheese and olives. Serve warm and ENJOY! I really like the picture of your daughter with the look of innocence…except for the cheese mouth ring. Little Lil’Luna is such a sweetie and looks like she is ready to dive right into that casserole. Think she was enjoying her cookie a lot more. Thanks Colleen!! She was ready to dive in..she loves cheese!! Nice looking taco casserole. I hope it would turn out good when i try it. I’m surprised at how good this was! I’m glad you liked it! Thank you for stopping by! It is 🙂 I’d love to know what you think, if you try it! Thank you! Made this last night. It was delicious! I am so glad!! Thank you so much for trying it! It’s so good! Hope you’ll try it soon! Made this for dinner tonight and BAAM, ALL GONE! Great and easy recipe to make! Everyone enjoyed it! Woohoo!! Thank you for letting me know! Here is a definition of biscuit…https://www.google.com/url?sa=t&rct=j&q=&esrc=s&source=web&cd=13&cad=rja&uact=8&ved=0ahUKEwj97dnR_9zYAhVCx1QKHfzRCP0QFgiAATAM&url=http%3A%2F%2Fwww.geniuskitchen.com%2Fabout%2Fbiscuit-mix-408&usg=AOvVaw15qD1t8rhpH6w0qJk2oIT8. You could buy it at your grocery store or even make a homemade version. Hope that helps! Hello! I am a wife and mom of three. I want to thank you sooooo much for the wonderful recipes. They have saved my ego many nights in the kitchen. Just wanted to let you know! Isn’t it so good! It’s a quick & easy meal 🙂 Thank you! It looks good….will have to try recipe soon. It is! 🙂 Let me know what you think! Thank you! I’m Keto, is there anything I can use in place of the biscuit/baking mix? Almond Flour? Coconut Flour? I am sure you could. I have not tried & am not familiar with all keto things, but you need ingredients that will make like a biscuit /puff up crust. Hope that helps! Here’s a recipe for low carb mix using almond flour. I have tried several of your recipes and loved them. I personally haven’t tried that, but I am sure you could. It might give it a different texture, but it could be an option. Let me know what you think 🙂 Thank you! I think that cornbread in place of the biscuit mix would enhance the Mexican flavor. Also, would include some onion (either green or white), along with some salsa. Yummo! Those would be great options 🙂 Enjoy! I have tons 😉 Let me know what you think of ones you try! Made the taco casserole tonight. We thought it was delicious I think next time I’d add onion but otherwise perfect. Just concerned we have leftovers not sure about reheating it tomorrow with the sour cream though? It is fine reheated 🙂 Yes, you can totally add onions..we are not onion fans over here, but I do like to add onion powder. It is so yummy!1 I hope you try it 🙂 Thanks so much!! These all look great. Thanks! Looks great and yummy! I might try it with corn bread mix instead of biscuit mix though. You sure could 🙂 Thank you so much!! Enjoy! Debbie how did the cornbread mix turn out, I was wondering if it could be done with cornmeal instead of biscuit mix. Can it be made first then frozen for later? Taking kids and grandkids on a family vacation and looking for some easy, make ahead and freeze meals which will allow me to enjoy our time together but can provide them a delicious meal at the end of our busy day. Yes, of course 🙂 Have fun on your vacation!! Hope they all love this dish! Made this for a group of 8 on vacation . Easy and everyone liked it. I melted cheese on top last 5 minutes in the oven; then topped with sour cream, shredded lettuce, salsa and more cheese. Yummy recipe. Perfect!! It’s great for a crowd 🙂 Thank you for sharing! Could this casserole be refrigeratored and baked the next night? 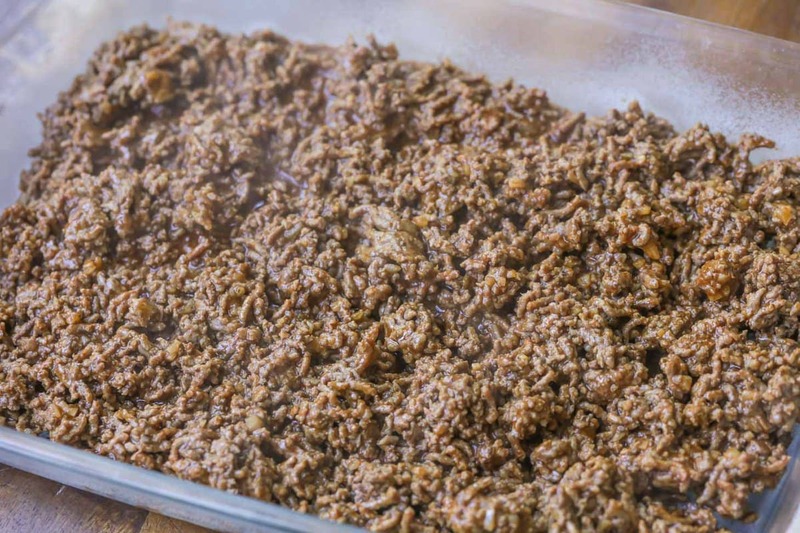 Can you use ground Turkey instead of ground beef? You sure could 🙂 I haven’t tried, but that would taste great! This looks delicious! You mentioned that you could add refried beans which I think would be very taste. How much would you add and would you put it on the bottom and the meat on top? Thank you in advance. You could add them under or on top of the meat 🙂 That would taste great! I have mixed a can of refried beans into the cooked and drained ground beef. It was good and my family liked it. It’s easier than trying to layer them. That works too 🙂 Thank you! This looks very yummy! I will be making this for dinner tonight! Could the biscuit mix be substituted with a cornbread mix? Only because I have a ton of corn meal! I haven’t tried, but one way to find out 🙂 I’m thinking it would be ok. This is so good, I hope you like it! I am so happy to hear that!! I am glad they liked it! Thank you so much for letting me know! Is bisquick ok? what biscuit mix did you use? Yes 🙂 I just used their original/normal bisquick. Hope you like it! its like taco salad in the form of a casserole. It makes for a hardier meal with the Addition of bisquick. Cant go wrong with this recipe! I am so glad you think so!! Thank you for sharing that!! I can’t wait for you to try it!! I hope you like it! Why not list 2 3/4 cups instead of 11/4 ? I am not sure what ingredient, the biscuit? I believe the 1 1/4 is 1 and 1/4 cups. It’s just that the space between the 1’s is not noticeable, but it’s there. Spacing twice between the 1 and 1/4 would make it more noticeable. This taco casserole was so delicious!! we make taco salad quite a bit, but I will be making this more! I love the bottom crust part. it was so filling & tasty! I dont quite understand the 11/4 measurent. Imwas halving this and it made it hard to get the biscuit max right. we love taco salad, so this is just taking it to a new level! it was delicious! I loved the biscuit/dough base. it was hearty & so tasty! This looks Incredibly delicious. I have to make this soon for my family! It is!! I hope they like it! I hope you will 🙂 I’d love to know what you think! My daughter has a GLUTEN allergy, I wounder if cornmeal could be SUBSTITUTED for flour, (there’s no gluten in cornmeal) just asking.. I can’t wait for you to try it 🙂 Hope you like it! Awe, thank you so much!! This sounds delish. We are going to a christmas party in a couple of weeks and i am taking this cass for sure! I hope it’s a hit!! Thank you! Loved it and my husband loved it too. Can’t wait till i try more of these recipes. Hi this looks sooo good!!! can this be made as a freezer meal? Looks delicious, have the ingredients. Looks brilliant but not sure where to obtain biscuit/baking mix. not something i’ve seen in uk. I find it in my grocery store, but I’m not sure where in the uk?? Have you tried googling it & seeing if a local store has it? Just found your site! Excited, i love texmex! I am glad you found it!! Hope you find some recipes to try! I used a pkg. of Mexican Cornbread (Martha White) instead of the Bisquick, adding some red & green bell pepper, jalepeno pepper and onion, all diced small. It was good!! I did not use sour cream but instead when casserole was finished cooking, I topped with cheese putting it back into the oven to melt and then once cheese was melted topped with lettuce, tomatoes and green onions..no black olives…don’t care for the olives or sour cream. Also, to my meat I added some onions, jalepeno pepper and rotel tomatoes and seasoning it with black pepper, onion and garlic powder along with the taco seasoning. I really liked it!!! Sounds great! Thank you for sharing what you did!! Biscuit mix is a mix made of flour, sugar, salt, vegetable shortening, & baking soda. So you need 1 1/4 cup of this. This is such a great recipe! 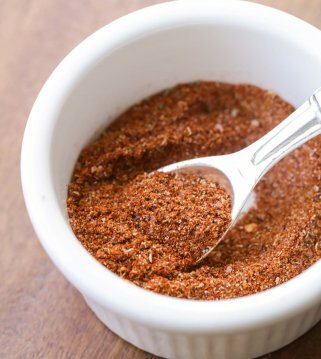 It’s super easy & has so much flavor. My hubby can eat taco salad every week, so this is a nice option to change it up! Bisquick is a pre-made mix of flour, shortening, salt, & baking powder. So, you need 1 1/4 cup. We eat taco salad all year round. I like the fact that this goes all together and has the same great taste. The biscuit kind of takes the place of the chips which Is a nice variation. my husbands hates casseroles. like hate, hates them. when he asked what we were having for dinner and I told him “taco casserole,” he was not excited. so why did i give this recipe 5 stars? because he liked it!!! and my kids (mostly) liked it! they ate it naked, other than cheese (nobody but me likes sour cream or lettuce or tomatoes) , but they still enjoyed it. Tell your hubby I am so glad he liked it!! Thank you for making it for your family! I’m a HUGE fan of tacos and casseroles, so when they’re combined in one, you better believe I’m in heaven! Thank you!!! 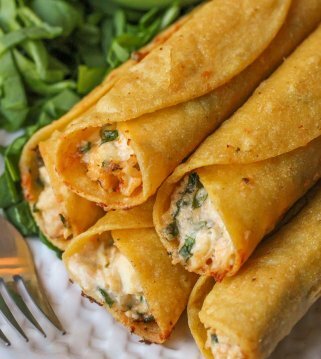 This will be a perfect weeknight dinner! My family loves tacos. Oh yuM! This is a perfect dinner idea! THIS WOULD DEFINITELY BE A FAVORITE IN MY HOUSE! YUM! Hope you give it a try!! It is so delicious! 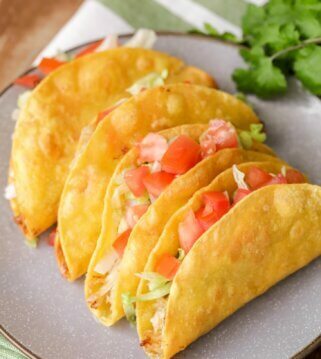 Tacos are my go to easy recipe. I make them almost weekly so i appreciate coming across varIations that i can make. Thanks for POSTING! For the NUTRITIONAL facts, HOW many servings does this make? This was soooo Yummy! We love OUR TACOS and this was just a different, yummy way to eat them! Thank you so much for sharing this recipe! Definitely will make this again! Glad to share!! Glad you liked it! It’s a fun way to change it up! I loved it! so easy:) Thank you!!! Glad you think so! Thank you so much! Don’t understand taco casserole biscuit mix. 11/4 cups. You need 1 1/4 cups of biscuit baking mix 🙂 It’s a pre-made mix usually found in the baking aisle. I personally haven’t tried, but I am sure it would work. Glad you thought so 🙂 Thank you so much! Looks wonderful…but the 90 percent saturated fat? iT WOULD ALSO WORK TO BAKE THE BASE AND SERVE HOT WITH ALL OTHER INGREDIENTS READY AND EACH PERSON CAN PILE ON THE TOPPINGS TO THEIR OWN LIKING. That works too 🙂 Customizable! I prefer it warm, but it definitely could be taken somewhere 🙂 It doesn’t have to be.